2011 graduating class is the first group to have had all their academic courses right at the Marie Poussepin Center (CMP) as part of the IHER system of the country: A methodology that strives to help people learn how to learn by following a work book, listening to a radio program and having a tutor. 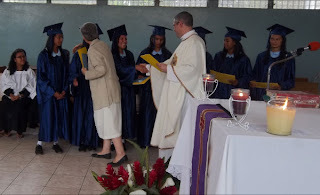 Previous graduating classes had gone to the public schools during their first years of junior high, however, in February 2007, our young women were able to have more intense and comprehensive formation right at the CMP. 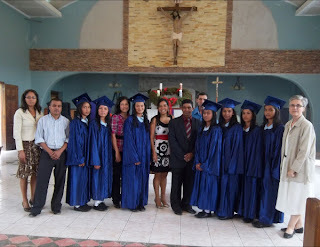 On November 29th 2011 the seven young women had their general exam in which they presented their social service project to a group of four IHER examiners, who came from the main office in Tegucigalpa. The graduating candidates presented their learning experiences in teaching several people the basics of reading, writing and math, as well as their alternative medicine project. They not only did well, but were congratulated for their accomplishments and presentation. They signed their commitment and took the professional oath of putting into practice what they had learned during the previous five years. On December 12th, feast of Our Lady of Guadalupe, the official graduation took place within the celebration of the Eucharist. The Dominican Sisters, members of the CMP team who had accompanied their formation, and family members, thanked the Lord with them and celebrated this important step in their lives. May they live the values learned as they move on to continue their university studies and/or the service to their village communities! 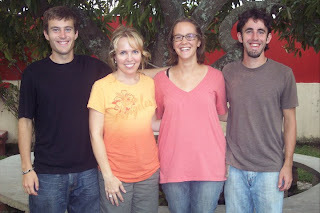 The year 2011 has been a year of many blessings for our Mission in Guaimaca: We are now five sisters in our community. Sr. Olga Iris Diaz is a good pastoral help both at the Clinic and at the Marie Poussepin Center (CMP). Besides several groups of volunteers thoughout the year, we had three full time volunteers from Stonehill College not only as tutors at the CMP but also collaborating in different projects of the misison. Sr. Teresa María Abelló's first year at the CMP has brought more organization and service to the students, parents and tutors and the fourth graduating class. Since the end of April, we have Joel Espinoza, a new agronomist at Nazareth Farm, who has brought new energy and agricultural practices, as well as good team work spirit to the farm. Sr. María Ceballos and Sr. Gloribel Mendoza have stregthened alternative medicine at the Clinic. Sr. Marta Inés Toro was able to obtain a few grants to carry out our service to the poor. However, as we move into the end of the year our main concern is to be able to pay about $10,000.00 in oustanding bills. We appeal to the generosity of our readers and benefactors during this Christmas Season! 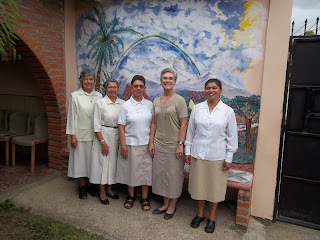 If you wish to make a donation for our mission in Guaimaca, please send it to: Dominican Sisters of the Presentation - Honduran Mission, 3012 Elm St. Dighton, MA 02715. Eight to ten young women ages ranging from 16 to 22 spent the last weekends of August and of November in a time of prayer and reflection to listen to the Lord’s call in their lives. They come from different backgrounds and experiences. These young women have been for some months, and even several years, discerning their vocation by spending time in prayer, reading God’s Word, talking regularly to one of the Sisters and attending vocation retreats. However, for most of them these two weekends have been the first opportunity to spend some longer time in silence and reflection, listening to the Lord’s will in their lives. 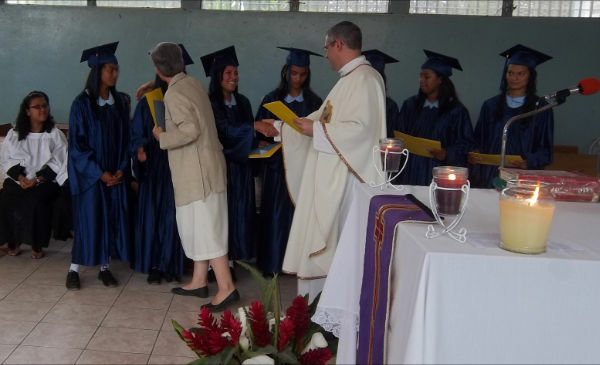 The sisters of the community in Guaimaca have always worked together in the different efforts to help young women discover their vocation in life. Thus, during these two retreats, all of them participated in some form in the reflections, prayers and follow up of the young women. In August, Sr. Vimala Vadakumpadan, our major superior from the USA was in Guaimaca, and she also took an active part in the retreat. At the November retreat Sr. María Ceballos, who has been in Guaimaca for ten years, reflected with the young women on Religious Life in the Church, using the Latin American Bishops document from their meeting in Aparecida, Brasil, and quoting Pope John Paul II when he speaks of the gift of Religious Life to the Church. Sr. Gloribel Mendoza and Sr. Teresa María Abelló guided the young women in several reflections based on scripture passages to see different responses to Jesus’ call: • The rich young man, as an example of the imperfect vocation • Matthew and Zacheus, examples of thieves to whom God “stole their heart”. There was good amount of time to reflect on Jesus vocation, God’s Word himself, and in the call of each one as well as some of their attitudes in front of the Lord. It was clear that there are fears that stop each one from responding to God’s call. We entrust these young women to the Lord, confident that through the intercession of Our Lady some of them will continue incarnating the charism of Marie Poussepin in Honduras!